Writing about animals is fun, because animals are fun. You can write about animals you know or used to know or wish you knew. Here are four ideas to get you started. After each question is a sample ﻿story﻿. The stories were written by Suzanne Werkema, the author of Upside-Down Jellies: 28 Animal Poems. Your stories don't need to be like Suzanne's. You can write whatever you want! My first pet (not including the turtle my brother squashed in a book) was a kitten. I was five years old and I didn’t want to go to kindergarten. My parents promised if I went to school without a fuss, they would give me a kitten. So I went, and to my surprise I enjoyed it. My kitten was gray. I named her Fluffy. She grew up, and we kept her for a few years. Fluffy had babies in a box in our basement. My parents found homes for all the kittens. One day I came home from school and I couldn’t find Fluffy. I asked my parents where she was, and they said, “We gave her to a farmer.” I was angry, but I knew it was too late to get her back. So I played with my toys instead. My aunt and uncle had a big dog named Luke. Every Saturday my aunt and uncle cooked pancakes. They always gave one of the pancakes to Luke. He took his pancake into the backyard and dug a hole and buried it. About a month later he tried to dig up his pancake so he could eat it. But by then the pancake had fallen apart and disappeared into the dirt. This happened to every single pancake Luke buried. He never seemed to figure out what happened to all those buried pancakes. 2. If you could have a wild animal or an unusual animal as a pet, what animal would you choose? Why? When I was in elementary school, I wanted three wild animals as pets. I wanted a skunk (with its scent gland removed), a pygmy marmoset (a tiny South American monkey), and a lion. The skunk and the marmoset would be fun to play with, and the lion could ride me around the neighborhood on his back. I never got any of those animals. 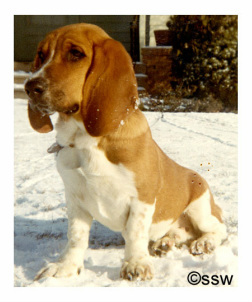 But when I was twelve, my family adopted a roly-poly basset hound puppy. We named him Davey, and he was more fun than the skunk, marmoset, and lion put together. 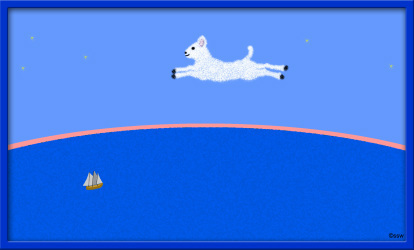 As a kid, I was not a good jumper. I could jump on a trampoline or a pogo stick, but not across a sand pit or over a raised bar. So I did not like the jumping competitions in gym class. I wish I’d had a kangaroo. Kangaroos are champion jumpers. If I’d had a kangaroo, I would have let her jump instead of me, across the sand pits and over the raised bars. I would have cheered for her from the sidelines. She would have been the best jumper in my school and won all the contests. Then she and I would have taken all her trophies and medals and traded them for kangaroo treats. I think the smartest animal in the world is Koko the gorilla. Koko knows 1000 words of American Sign Language. She also understands 2000 words of English. She can put signs together to make new words. Koko cares about the people who work with her. She's sad if something bad happens to someone she loves. Scientists think most gorillas are smart. I hope someday I can meet a gorilla like Koko and she can teach me sign language.